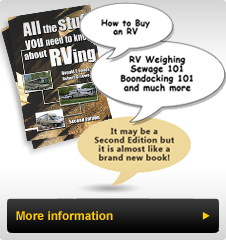 Beginning in the fall of 1996, when I was appointed as the 1st Canadian Bounder of America Chapter Technical Representative, I began writing technical articles that relate to the ownership and maintenance of a Bounder motorhome. Some of the topics covered are items that occurred with my 1994 34J Bounder, others result from working with other Bounder owners. While some of the topics are chassis related, most relate to the coach. The underlying philosophy was to promote an exchange of ideas and useful hints that make it simpler to own a Bounder. As part of the process, I have invited all that read these articles to contact me. If you have found a product, tip or techniques that you want to share with other Bounder owners please call or write and I will endeavor to write about. Any technical questions or situations that you want explored should be forwarded and I will attempt to assist. As I met other Bounder owners and traveled, a few areas of concern and some great ideas were exchanged. Each article will highlight items that were mentioned or that I think should be brought to everyone's attention. Most of us are familiar with the yellow sticker on the top step, or the reminder in the Kwikee electric step owner's manual, that recommends lubrication every 30 days. Have you lubricated all of the pivot points? I ran across an owner who asked me to look at his step, since it not fully extending. Although he had lubricated it regularly, he missed the crucial pivot rod tucked up under the body. The pivots requiring lubrication are those that you see, where the supports join the side of each step, and even more important are those under the body in the mounting bracket, above the top step and by the step motor. The rod that connects the motor to the actual step assembly has four or five bushings in it. The best lubricant is spray-on grease sold by Kwikee or Castrol Chain Lube to properly lubricate your step. An alternative although somewhat messy is a squirt of SAE 30 oil. Use of an oil-based spray lubricant, such as WD40 is really not that effective, in fact this particular lubricant is used in industry as a cleaner and solvent. If you use the spray, ensure that you have the plastic spray tube, since you must reach under the body and hold the can upright and reach the lubrication points underneath and in the back of the step. With the step fully extended, spray or squirt oil on both sides of each of the pivot points. Remember to lubricate the motor pivot and the rear side pivots that the top step works on. Open and close the door to move the step a few times and re-apply. Lubricate all of these areas, both the visible points and the ones that you cannot see every 30 days. Your step will always be ready when you need it. Many people commented on a portable, compact, cube-shaped heater that we had in operation at a cool, wet fall Chapter meeting. We first saw this type of heater when we met a Bounder couple at a campground, who showed us through their Bounder when we were first shopping for a Bounder. This couple had a small ceramic heater (often called a portable furnace) that quietly kept their rig cozy, using the campground's power rather than their propane furnace. These units are cube-shaped about 7 or 8 inches square and contain a ceramic heating element, a two-speed fan with air filter, an adjustable thermostat and a warning light. The exterior case is plastic that stays cool to touch and there is a safety switch, should it fall over. A typical heater draws 1,500 watts and generates 5,200 BTU of heat. In addition to heating the rig during the cool parts of the year, it can be used as a cooling fan in the summer. Some come with an oscillating base or fins to direct the airflow. It is useful at night, as an alternative to the rear furnace that keeps some people awake, and I use it to load the generator when "exercising" the generator. These heaters are available for $40 to $60 at most discount and warehouse stores.